The Outer Space Men, the classic creation of Mel Birnkrant, are headed back into your collection as a new line sculpted and produced by Four Horsemen Studios. Here at IAT, we weren’t familiar with the original line and wanted to learn more about it to help us appreciate the new versions. We were fascinated by what we learned, but we still had a few more questions. For those answers, we turned to the greatest resource there is on the Outer Space Men, Mel Birnkrant himself. We learned a lot talking with Mel, so much so that part of me wanted to simply post our exchanged e-mails. And that’s more or less what we’re going to do. Mel responded to our interview questions in the form of an e-mail response and rather than edit it into an article format, I’m just going to let Mel speak for himself. We’ve bolded our questions, but everything else is straight from Mel to you. Now, we’ll warn you – we let Mel have free reign to respond as thoroughly as he wanted and he lived up to our expectations! So, pencil in some quiet time, mix up a batch of Tang or grab a freeze-dried ice cream sandwich, relax, and enjoy. In your introductory letter you posed a question that led to several days of reminiscing. I found myself recalling events that happened over forty years ago, more vivid in my memory today than what I had for dinner yesterday. I hope you won’t mind if I respond to what you wrote below, even before the interview officially begins. IAT: People tend to look back on the past through the lens of “now” and that can make it difficult to understand the fabric of how things used to be. We can learn facts and figures about previous times, but it’s not always easy to understand what people were thinking or experiencing at the time. 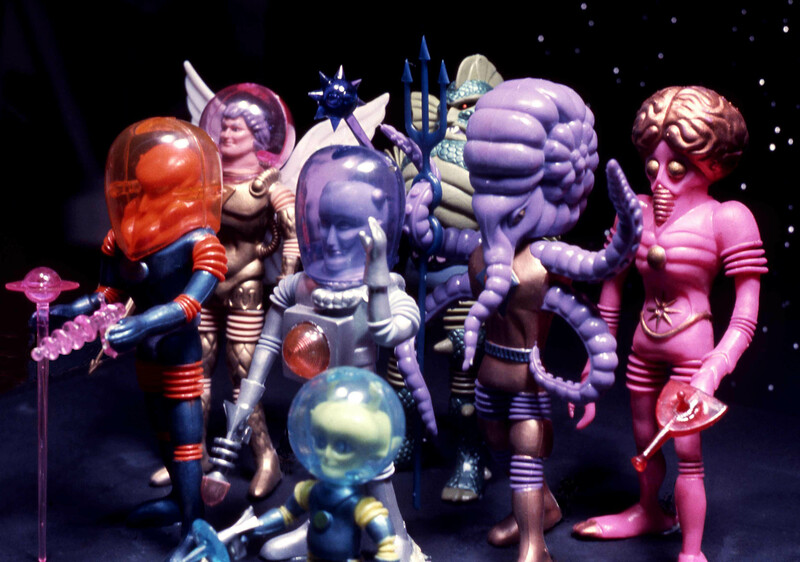 What can you tell us about the state of toys when the Outer Space Men were introduced? Let me attempt to weave a remnant of that fabric for you: First and foremost, it was a World devoid of Action Figures. Before 1967, when Matt Mason and The Outer Space Men were created, there was simply no such thing! G.I. Joe was just a dress up doll for boys, and Captain Action too, in terms of play pattern, was closer to Barbie than to Batman. No one even recognized Action Figures as a “category” until Mego introduced their line of Super Heroes nearly five years later. Although the Space Race was in full swing in 1967, Flying Saucers, as they called them, had still been glimpsed only from afar. Terms like Aliens, Extra Terrestrials, and UFOs had not yet been invented. Close Encounters and sightings of the now familiar “grays” were generally unknown. Outer Space was still an empty slate upon which any story could be written, and to populate the Universe with beings of my choosing, no previous occupants needed to step aside. To fully understand The Outer Space Men, one must accept a concept that many action figure collectors embrace unknowingly. Few realize they are indulging in idolatry. The Outer Space Men are not “just products”, but Life embodying Idols of an alien, yet familiar, Mythology. One must also open their mind to the possibility that an image can sometimes strike a universal note that implies, through form alone, that it not only represents a living being, but might, itself, contain a spark of Life. I always sought that element, perhaps subjective and imaginary, in the multitude of iconic images I’ve collected all my life. And I also believe that the simpler and more stylized an image is, the more powerful the life force in it is apt to be. For example: Mickey Mouse in his earliest incarnation, an exercise in pure geometry, is more “alive” than, say, a Madame Tussaud’s Waxwork, perfect in every detail of death-like immobility. If you, like me, agree that Mickey, in his direct simplicity, radiates life energy, then you will understand The Outer Space Men. IAT: It seems that some biographical info or copy might have been integral in the transition from products to action figures, moreso than articulation or accessories. You’ve said that the OSM biographies were a “spontaneous afterthought”, but do you think that helped them catch the imaginations of the kids of the late 60s? And what inspired you to keep the biographies from casting them as heroes or villains? Articulation and accessories add what in the toy industry is referred to as “play value”, in other words, more things to do. But what gives Action, or its implication, at least in my opinion, is “Imagination”. A toy that is powered by imagination trumps batteries any old day. The little stories were an attempt to fire the imagination and send those unfamiliar entities out into the atmosphere of planet Earth, not altogether naked, but cloaked in a biography, a mysterious letter of introduction, to help them out along the way. As long as Mel lets his designs talk as much as he does My wallet and I will be there! Can we not mention wallets? The 4H are going to force me to ramen noodles and no broadcast TV! Yeah! Wallets are a no-no subject around here. Once we got the e-mail back from him, we knew we should just print it as is. Many of the photos are even where he included them in the e-mail. He wasn’t kidding about his intuition. This is a GREAT read. I have to say I am looking forward to this line almost more than the idea of a new take on Micronauts from Hasbro. So many places for the line to go. So many places for a child’s mind to go with the play value. Small brave independent toy companies like Onell and the 4Horsemen, along with their ever growing legion of appreciative and dedicated fans, are the toy industry’s salvation. I liked that too. All the innovation is coming from the smaller companies if you ask me. Mattel might be getting somewhere, but it’s on the backs of the 4H. ToyGuru is just the dork in charge for this week. The Four Horsemen will still be making cool toys after his tenure as brand manager is over. Thanks, Tek! More than Micronauts? Have you checked your temperature today? Great interview! I’ve been to Birnkrant’s website and I didn’t get the Mickey Mouse thing, but I understand better now. I’m pretty sure he has more Mickey Mouse figurines than I do action figures. We almost asked a Mickey Mouse question outright, but we wanted to focus on OSM. Mickey still found his way in though! Great stuff Noisy. Very good read….Mel is an interesting guy. Fantastic. I love having his thoughts on the whole thing from the past to the present. Me too. I really enjoyed the transition of the article from before the OSM to the future of the 4H line. Wow. Great interview! The man wrote his answers like poetry. Thanks, for the interview guys! Great interview! He’s an interesting guy! It was a small part of the interview, but I was surprised to hear about Wonder Woman. Her book sells decent now and she was a big part of the SA, it’s weird to think she had a rocky start. I’m not sure, makes me want to read up on the character’s non-fictional history though! Excellent interview. Mr. Birnkrant is a fascinating and eloquent man, and I’m looking forward to seeing his work interpreted by the Horsemen. dude, for real… it’s hard to read that and not convert. i’ve been stalwart, thusfar, in my stance that the old is best left to the past, and that dinosaurism was more at work here than real creativity… bet i confess, this interview… mel thinks about toys the way i think about toys, and him “putting down the tracing paper pad” and wanting to just sit back and see what the boys do… that’s extraordinarily cool. and his thoughts on art and life really got me into his head, which in turn echoes my own headspace… the universal oneness of being indeed. if i wasn’t a fan before, i certainly am now. great interview noisy… you know you kids… i remember what the toy world was like before this interview, and it may shock you to hear this, but there were a lot of jaded pricks buying toys that didn’t really make them happier or express their thoughts/feelings/desires… true story. but i was here when this interview kidney punched that attitude and left it quivering and crying uncontrollably in an alley and took its money, watch, and shoes to pawn for OSM money. It seems that the most successful toys are always the one’s spelled out for us twenty or thirty years ago. Rare is the toy line you walk in and find with no clue what the backstory is anymore. What do you think was the “last” great toy line? I love hearing about this line. I’m on pins and needles waiting for pricing and release dates! I imagine we’ll know more soon. SDCC looms. Great Interview! I usually shy away from anything that doesn’t fit my basic collections these days — super-heroes, sports — but if the price is right on these, I may splurge, especially at the 3-3/4 scale. I feel the same way. Everything has gotten so expensive that it’s better for me if I stick to just one or two toy lines that I really love. But these look cool enough to pick up despite my not having a connection to them. If the price is right, I’ll have to have these. Mattel’s got their hooks in so deep, I’m mostly just buying Classics to stay on budget! Great interview. I’m still not sold on these though. I keep worrying that the low runs will simply make them cost too much. Price is always in the eye of the beholder, but I don’t think they’ll be priced too high. That was a fun interview. He really has a way with words. It’s nice to read someone being truly passionate about what they do. I agree with Mankeo- his wording is so eloquent! It was nice of him, too, to take the time to give such lengthy responses to your questions. 🙂 I am intrigued to see what the OSM line has to offer and to hear more from Mr. Birnkrant about it! Okay, okay. Where do I sign up? Great interview, guys, you’re becoming a major player! We’re trying anyway! Hopefully, the 4H will announce more solid plans closer to or at SDCC. I’m really impressed by out of the boxing thinking that went into the old toys. I only hope the 4H are putting that much thought into their new line. Great interview! Wow. That was very “stream of consciousness”. I almost missed the multiple pages (when did you start doing that? ), but I’m glad I didn’t! I loved the shot of Astro-Nautilus at the end. The big hands and feet on the figure make me happy! When will these come out? The big hands and feet are really appealing to me as well. I can’t put my finger on it, but the WIP picture looks really cool by itself, unpainted and all. I loved hearing about the old line. Thanks, guys! Great interview. Love the enthusiasm and passion going into the line. I think it showed in the designs now and I know the 4H will make it speak now, even loud enough to get through the buck system. I’m really looking forward to the 5th and 6th figures in the line. I don’t know who they are, but the 4H conquered the more traditionally suited characters in this first announcement, I can’t wait to see them flex their muscles on Colossus and Cyclops. Wow. This was a really great read. You guys should do more interviews! Thanks! We do have a few more in the works. Fantastic interview… Must’ve been an honor to correspond with such a great guy. I love Mel’s views on toys. Which to me confirms the great and hopefully long lasting relationship he’ll have with Onell and the 4H. Thanks for the great read! It really was. When he contacted me over my “Who Are The Spacemen” article, I was a little starstruck. It’s been a pleasure e-mailing back and forth with him. Thanks for the interview. I was looking for more about the OSM when I found your site! It’s great that they’re coming back! Great interview. I love his personal site too. He has an interesting viewpoint on the toy industry. I could spend hours on his site reading everything. Ton of history there. Have we heard when these will be coming out yet? And how much? I’m hoping they’ll be cheap enough to fit in my budget. Not yet. When we hear, we’ll let you know! I plan on buying two sets. Mel sounds like a very interesting man. Has he done anything else that a grumpy old toy collector would know? Odds are, you’ll find something you remember. Thanks, Harris. It was a ton of fun for us. I just found out the Outer Space Men were coming back out again! That’s fantastic! I’ve been waiting years to for these guys to get updated. I still can’t quite believe it! VS, if you see this, drop me a line! Great interview, guys! Fascinating stuff.